There are some people who can transform the way you look, thereby giving you the confidence to step out into the world with a bounce in your step. To me, my friend and dress designer Sharmila Bajoria is one such person. This post is a tribute to this lovely friendship which enriches my life. Enjoy a special recipe of hers with fresh peas – Hare Matar ki Chaat. I have known Sharmila since Class 11 in Adarsh Vidyalaya, a school in Chennai. She was a couple of years older than most of us in class, she was also taller and more confident. And yes, better dressed too. She seemed to have an uncanny knack with colour, fabric and design even then. No wonder, most of us just looked up to her. She never lost her cool and always seemed to manage more of life than the rest of us. Her mother was suffering from cancer and Sharmila took care of her, almost reversing their roles. She got married and went away to Kolkata as soon as she finished school and we lost touch. 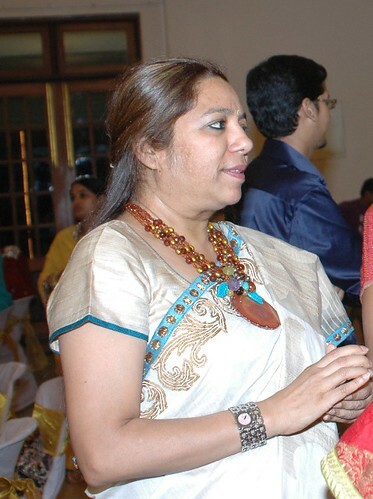 Years later, she came back to Chennai and set up her design unit known as Vastrini. I still remember going to the store and feeling awestruck at how well she had done it up. It was the first boutique studio in Chennai and she displayed gorgeous creations. As far as my own skills are concerned, there is much I have learnt from this talented and generous friend of mine. Her skills as a home-maker and as a hostess are exemplary. She has an awesome recipe collection in her memory and knows how to make simple yet impressive menus for every single meal. To me, she is a one-stop place for many things – for a recipe, for a quick fix for sudden guests, for upholstery and curtain decisions, for my daughter’s trousseau which she handled so effortlessly, for the times you want to sort out your emotions, or simply want a sympathetic ear to pour out your misgivings. And yet, what is truly commendable about her is her willingness to change. I have seen her go through life with an openness, constantly reinventing herself and adapting to the challenges which is life’s other name! Have a fabulous birthday and a happy year ahead, my dearest friend. May you grow from strength to strength, with serenity and cheer paving your path! This dish tastes best with seasonal fresh peas which are sweet and tender. I especially drool after the winter peas from Jaipur & Bikaner. They are tender and sweet as though coated with sugar syrup. I have seen many families in Jaipur prepare a sabzi with winter peas just a few minute before everyone sits down for their meal. A simple tempering with spices and the sabzi is ready. In this recipe, Sharmila cooks the fresh peas along with boiled mashed potatoes, adds a dash of spices and wow – the chaat is ready! Mix the shelled peas and the mashed potato along with a pinch of salt and half cup of water in a bowl. Place in a pressure cooker and cook for up to one whistle. Switch off the flame and allow to cool. Pound the chillies and ginger and add to the peas-potato mixture. Add the tamarind pulp, chilli powder, cumin powder and black salt. Add the coriander leaves. Pour a ladle of this mixture in small serving bowls and top with the chopped onions. Crush the chips lightly and garnish on top. 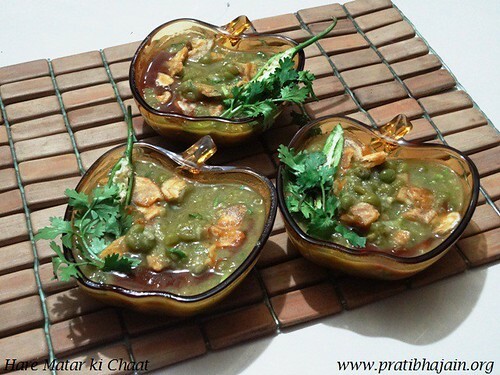 Enjoy the Hare Matar ki Chaat while it is hot. Sharmila says that you can add add sweet and sour chutney (made for chaats) and a dash of lemon to the chaat. It also makes a perfect base for the popular chaat – ragda patties. Sharmila Bajoria is a dress designer from Chennai, creating under the brand name Vastrini. She loves off-whites and beiges, although she can play with colours and patterns at a pace that can leave the onlooker feeling dizzy! If reading this post reminds you of your best friend, we would love to hear from you. Click on the comment form below and tell us about your special friendship.